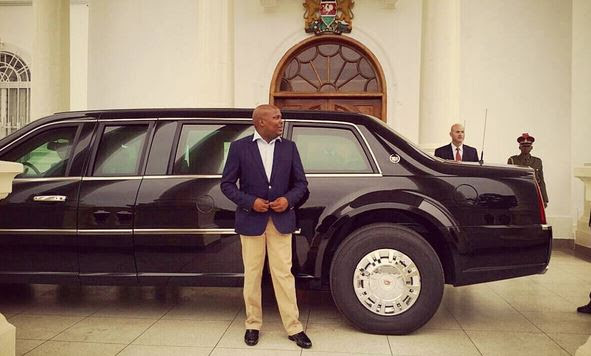 OF THE numerous photographs that did the rounds on WhatsApp, email, Twitter and Facebook from Obama’s visit to Kenya, the one that made me look up and take notice of our overall focus was one of a chap with his hand on the bonnet of “The Beast”. I sat up because the fellow in the photo was described as the Personal Assistant (or Private Secretary) to the President of the Republic of Kenya, and named as Jomo Gecaga. 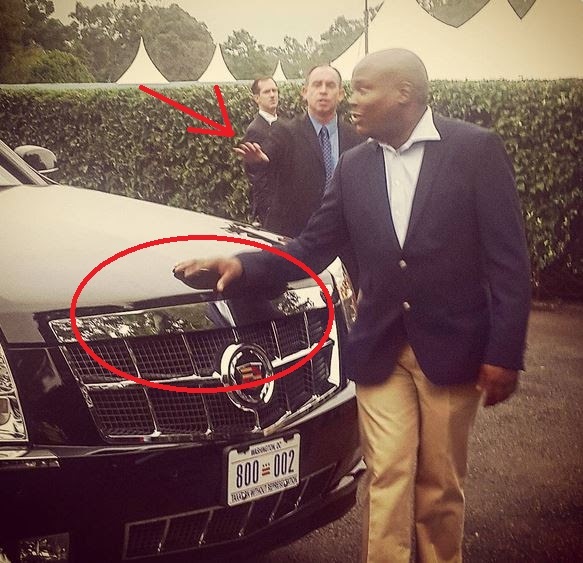 The man appeared quite foolish in that photograph as a Secret Service fellow appeared to be stopping him from putting his hand on the vehicle. That Gecaga fellow’s excitement at being near the car that conveys the President of the United States was a little understandable until I discovered that not only is he a nephew of Kenyatta, he IS Chief of Staff of the Kenyan President and attended some of the best schools in the world – including, according to the internet, Eton. THAT GUY was the one having his photo taken next to the car of the US President the way those kids in your village do when you drive your second hand four wheel drive car over there for Christmas?! I was flummoxed, which sounds like the Sheng word for the kind of punishment one would mete out to a fellow caught in his situation according to that photograph. Even a well-heeled chap like that one could lower himself to this and get told off by askaris? America is a superpower kweli! And I couldn’t laugh at him properly myself because over the entire period almost right up to this point, I find that most of the material being shared with me by otherwise upstanding members of society is the WhatsApp, Twitter and Facebook equivalent of copping a photograph with one’s hand on “The Beast”. Check your phone and laptop – how many people sent you links to the terms of the pacts and bilateral agreements signed between Kenya and the United States during that visit? How many of your pals engaged in insightful analysis about how Uganda (or whatever other country you are in) could benefit from the presence of the United States President and right here – right next door where we go on bus rides to see rally cars, eat nyama choma and collect cars from the port to drive them back to Kampala? Did any of your pals talk about the Global Entrepreneurship Summit, especially since Uganda was named yet again just TWO WEEKS AGO as the world’s most entrepreneurial country? Did Ugandans set up Rolex stands from Jomo Kenyatta airport to trap all the Secret Service men and possibly even entice Obama? Did we do anything to stress to his entourage that the single entry visa that put them in Kenya could have elicited value for money if they hopped over to Uganda quickly for a day – perhaps even using the airport parking of British Airways, since those ones are not going to be around for a while anyway? I didn’t even hear about any serious restaurants creating an #ObamaInKenya rolex and putting the menu online so they attract Google search hits to their websites. Obviously I might be linked to the wrong social and business networks and should therefore seek to join those in which members were invited to or made their way to the Summit in Nairobi to mingle in with globally accomplished entrepreneurs from the United States and across this continent. Do you know anyone who went to meet with the billionaires that accompanied Obama? Maybe one of them met ex-Mayor of New York Michael Bloomberg (worth US$37.5billion), Businessman Aliko Dangote (worth US$17billion), and TV Sharks Daymond Garfield John (worth US$250million), Barbara Corcoran (worth US$80million), Mark Cuban (worth US$3billion)…the list is much longer! Luckily for my self-esteem, none of the people I have been communicating with has sent me photos of personal achievements such as standing next to the Presidential Car or a Secret Service Guard. But sadly, none has shared with me their prospects for increased business and entrepreneurship or even personal development pursuits with the United States. All I have received so far are Gecaga-istic exclamations around Obama and the paraphernalia around his office. Jo put this post up onto his Facebook page last night and my first response (and it’s rare that I respond to Facebook posts) was to copy the link to this article I wrote in September 2013 and paste it in. But the article was NOT online! My dislike for boda-bodas and their operators should be common knowledge by now, but I am learning to live with them and mourn people who die falling off them. Now there is one specific aspect of the boda-boda business that presents an irony which I implore our economists and managers of this society to spend energies on. A couple of months ago, at a gathering of mobile phone enthusiasts we call ‘Mobile Monday’, I met Michael Wilkerson, a young American fellow running a company called Tugende, whose primary focus is financing for boda-boda operators to own their own motor bikes. I was surprised to find this Stanford- and Oxford-educated American had relocated to Uganda to apply himself to this issue. That is the reality for many boda-boda owners, and which Wilkerson’s company seeks to change through a funding programme that transfers ownership of the wretched mopeds to those irritating road-users. But I also know a guy called Patrick Omare whose closest encounter with Stanford University education has been leaning against Andrew Mwenda’s vehicle for a photograph when it’s occasionally parked outside The Independent offices. This Patrick is an entertaining fellow when observed at work because he earnestly indulges in occupational buffoonery that I classify under a file titled, “Office Clowns”. But this Patrick has bought up a couple of pieces of land in his Eastern Ugandan village and near Kampala City itself by way of his version of the Tugende concept. 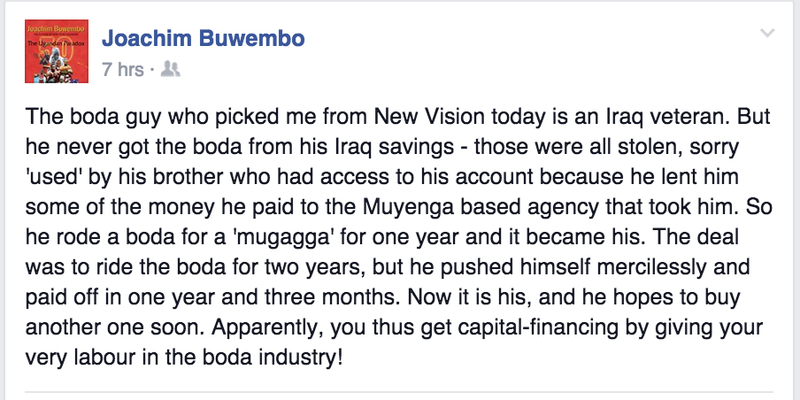 It started with him asking his employer for a loan to buy land. His employer, not clear on the collateral Patrick presented, instead bought a boda-boda and put it under Patrick’s management. He explained that Patrick would get a rider, have the fellow operate the machine and pay back 50% of profits or a minimum amount of money every single day till the original cost was paid back, plus an extra two months, and the rider could take the machine as his very own. All money would be put into a second boda-boda, and so on and so forth. The concept eventually sunk in, and Patrick bought his piece of land a year and a half later, and now runs a fleet of boda-bodas. He isn’t stinking rich by ordinary standards, and has had a couple of the things stolen from him, but he is doing alright. So, at this point, an American with the world’s best education and the humbly-schooled Patrick from Eastern Uganda have figured this out and are operating more-or-less at par. Which is why I’m seeking an economist to figure out why this can’t be replicated for other stuff that would make more sense for us as a country overall and cause less death and disorder. Why, for instance, aren’t we buying our cars in this manner the way the rest of the world does, which enables them to afford brand new cars and provides the capital to invest in manufacturing or assembly? Why can’t the Pioneer or UTODA buses be funded in this way so that our transport system gets cleaned up? More importantly, can’t the same philosophy be used for tractor purchases countrywide to change the lives of millions of farmers…and the country? What about somebody funding agricultural pre-processing plants in every district using this very same formula? What’s the missing element? Or, what’s that magic element in boda-bodas that draws in the Stanford and Oxford educated American and my man from Eastern Uganda? Over to the economists and managers of society. wake up! the greeks are coming! IN the midst of all the excitable politicking that has engulfed most of Uganda today and will probably fill our every thought for the rest of the year, a big story has been unfolding on the global stage with the realisation that Greece is flat broke. Few of you have been as broke or in as much debt as the nation of Greece is suffering right now, but if we don’t pay some wise attention we will individually be even worse off in about a year or so. You see, the brokeness of the Greeks should not lull us into a sense of security and complacency. Actually, while the world marvels at how badly run they have managed their finances over the last ten years or longer, Uganda is bagging great reviews from Economists and analysts left, right and centre (pushing pessimists firmly aside). The IMF has conducted periodic three-month reviews of our economy and consistently scored us highly for about a year now; a Harvard-based economic think tank declared in May that we were poised for even greater things in about a decade if we focus; and we are climbing consistently out of the list of poorest countries in the world. But the wise among us should worry and consider that this news of the poverty of the Greeks might be a Trojan horse that will soon offload piles of Greek businessmen, plumbers, carpenters, teachers, and so on and so forth. Even as we speak, I have over the last three years encountered a number of products being made in Uganda as a result of the Greek economy collapsing. One of those items is a brand of jam that is made out of local fruits by a group of local women in Jinja and is on some supermarket shelves. I am quite happy with this jam because it is made in Uganda, and the Zesta people are certainly feeling the pinch. The local women in Jinja were mobilised by a Greek lady whose name I know not at this point, but who relocated to Uganda with her husband after the economy collapsed there many years ago. They sold what little they had left, got in touch with some close relatives who have been here for a couple of decades, and jumped onto a plane for tropical, sunny, opportunity-laden Uganda. After being on holiday for a few months living off their depression-depleted savings, the old lady took an interest in the fruits she saw dotted about her neighbourhood, and the ladies that were hanging about. It didn’t take long for the business to kick off, and now they have products on the shelves! And that is just one old, retired couple. 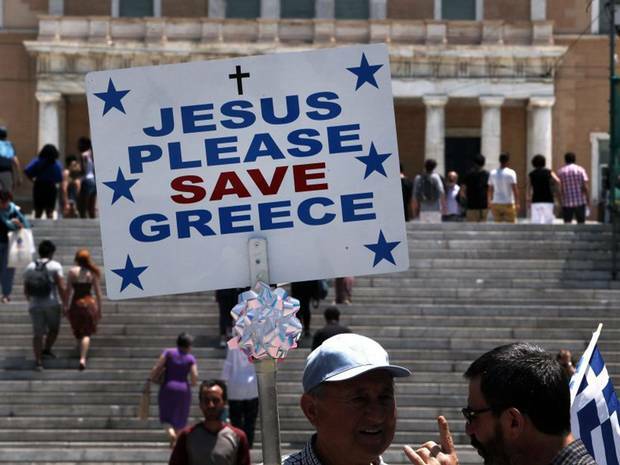 What is going to happen when a couple of million Greeks make the decision to come and settle here? First of all, in all recent surveys more than 55% of the Greeks say they are willing to emigrate because of their economy being so lousy, and they don’t mind much where they will go. Then, the strength of the Euro vis a vis the Uganda Shilling means that even a poor Greek walking in here with a couple of thousand Euros has a good beginning to lean on. It will be worse for us if they come in with a few old tools or pieces of equipment which we don’t have and can’t even use, together with decades of experience that they have gathered in production, commerce and tourism – even though their record at financial management is extremely lousy. But our biggest fear should be the superiority complex that they will definitely carry with them, juxtaposed with our inferiority complex here when a foreigner shows up. If we don’t step up and begin to make use of the opportunities around us as indigenous, capable Ugandans with vast resources, somebody else is going to come here and do so; and if that somebody is an energetic Greek with all the above and faces as little competition as we provide, then we will be eating more Packed Jam Made in Uganda and owned by Greeks. what’s our beef with cows, steaks and leather in Kampala? MY FAVOURITE Argentinian was a fellow in Uganda called Pedro Seambelar. I found him working at British American Tobacco and made friends pretty quickly for a number of reasons, and the one time I was upset with him was when we were planning to host the gods of our global tobacco leaf business, on a visit to Uganda. In that Board Room putting plans together, I was irritated that Pedro spoke up in support of the idea that the meat that would be fed to the visitors in Hoima be bought from all the way in Kampala. I objected on the premise that there were certainly enough butchers in Hoima to supply our needs, but heard back the view – not from Pedro alone, but also from a South African, an American and a Briton in the group – that our beef was generally not good enough. I eventually lost the argument, but heard quite a lot about how we don’t achieve good cuts of beef, don’t age it well for tenderness, and so on and so forth. 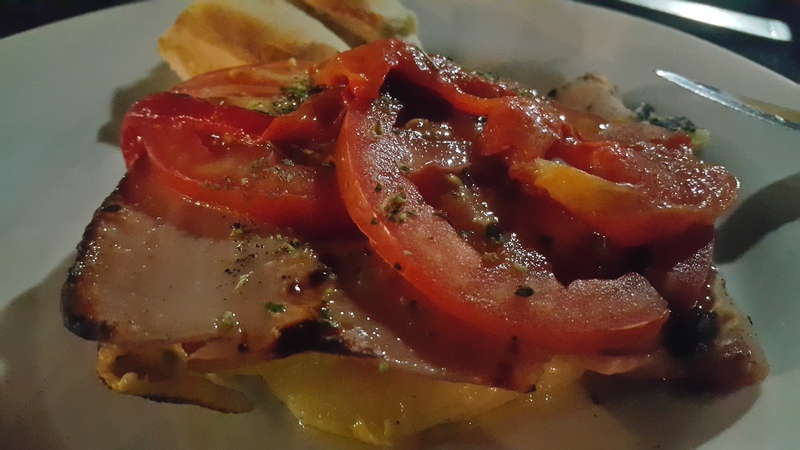 As I ventured out to my first of many restaurants in Buenos Aires the other week, that discussion was on my mind because I very badly needed to demystify the superbovine Argentinian concept of beef. Even as I type this out, my salivary glands are reacting to the juicy memories of the week’s dining in fine restaurants, train station meatstops and mall food courts. Every one of them, without fail, offered up a consistency of beef that caused me some concern about my situation back here. For about a year now I have boycotted beef in general at home unless it is minced into a hamburger patty or braised in an upcountry location preferably at a traditional ceremony – both guarantees that it will be extremely tender and full of flavour. In urban spots and most Kampala restaurants I generally avoid it especially if it is served up in those chaffing dishes that form the buffet gauntlet that is honestly the bane of the busy lunchtime diner. The Argentinians certainly know their beef, I agreed, but so do a good many people in upcountry Uganda. 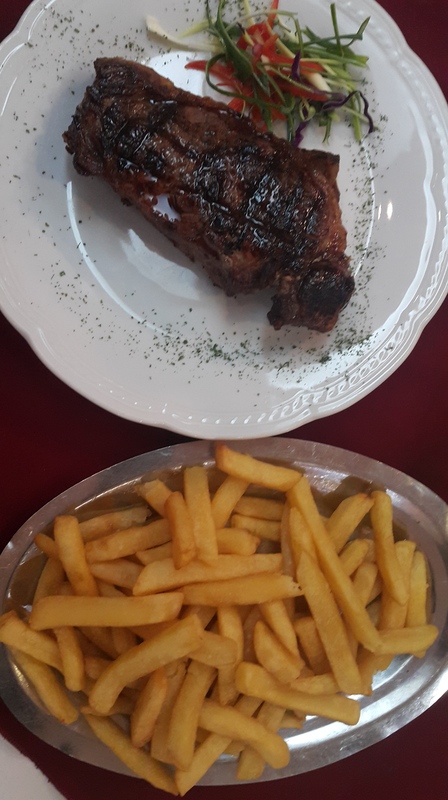 As I munched through various types of tender, juicy steaks I read through piles of brochures and leaflets and magazine and internet articles about this Argentinian beef and kept finding references to the cows themselves being given special treatment throughout their lives. A lot of specific care and attention goes into the cows’ feeding, breeding, transportation and even slaughter and carcass management. The role of the chefs, therefore, is made much simpler because the product presented before them is in such fine form, rather than driven down in cramped trucks to crowded abattoirs for slaughter then hacked up with pangas into indeterminate chunks. Is it possible that beef over here would taste better if we had abattoirs positioned in upcountry Uganda where the bulk of the cows are produced? And what is so complicated about abattoirs that we cannot have some set up in locations closer to where cows are herded? Are refrigerated trucks very hard to create? Can’t engineering students design some and modify things to make them? What do our food, science and technology students study and why can’t they give us ways of turning all our cows into superb steaks that we can use to attract dollars to Uganda the way Argentina took mine the other week? Where do all those hides and skins go after the abbatoir, and why isn’t Basajjabalaba a producer of leather belts, jackets, wallets, luggage and furniture the way so many Argentinians are? What simple item can we pay enough attention to all through the process from inception to the time we serve it up, so that we make Uganda world renowned for it the way Argentina is for their beef steaks? how do you like your eggs – stupid or AGOA? ON Monday morning most of the urban elite that crowd my visual space started their week off with the usual excitability around our national politics, while griping in passing about the rise in fuel prices and the strength of the United States dollar. I picked up my copy of The New Vision with my mind on a story that I read a couple of weeks ago about a poultry incubator in Iganga that was lying idle and unused for inane reasons presented by adults of severely diminished intellect. I gauged their intellect from the comments reported in that story – a cutout of which I have kept with me. The “multi-million shilling” incubator was donated to the farmers in Iganga three years ago and has NEVER been used. 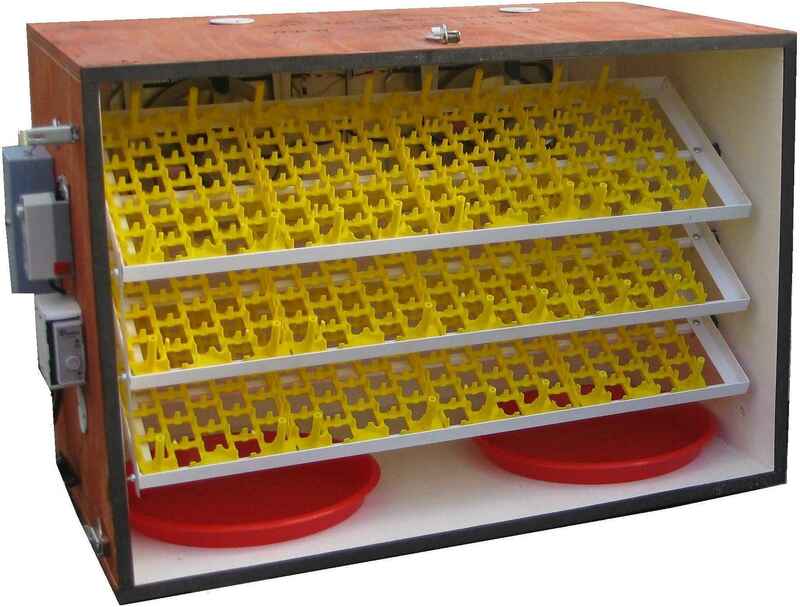 48-Egg incubator (forget that idea of 500 trays) costs between US$40-70! 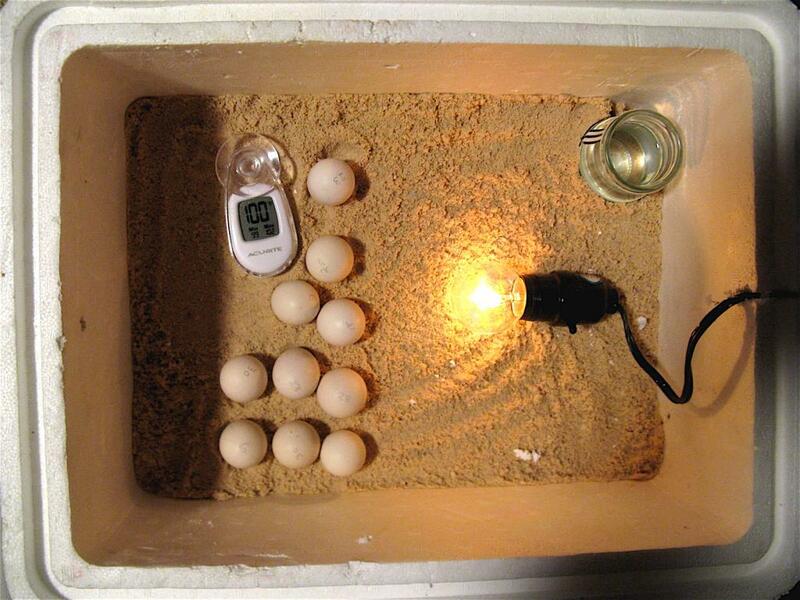 And I even remembered something about poultry and incubators from my past – we used to MAKE OUR OWN INCUBATORS! They were fitted with lightbulbs and other ordinary things that were available even back in Obote II. Can we get some youths to manufacture them so we address the unemployment issue, even as we convince Iganga farmers to use the bloody things? I think so – but first, let’s run around politicking. But then, on the day that story ran in the news and even the day after, there was not much of a hue and cry in my circles about how ridiculous this was. Jump to this Monday morning where, on Page Two of my newspaper, I found a small article stating that the United States President had signed the Africa Growth and Opportunity Act (AGOA) last week, renewing it for another ten (10) years! The key changes to the Act are found here (http://agoa.info/images/documents/5659/agoa-extension-and-enhancement-act-of-2015-2.pdf), but the full text has not yet been released – not that any of you would read it if it were. There is a long list of products – 6,000 in total – that countries in sub-Saharan Africa can send to the United States without quotas and tariff free under AGOA. Uganda is one of 40 countries eligible for the AGOA benefits, and has been on the list from the start in October 2000. We even set up a factory and recruited people who actually made clothing (apparel) that made its way to the United States – and I saw some with my very own eyes in a store over there. Today, though, as you drive past the Bugolobi factory where this project was established you will see samples of imported tiles positioned to indicate that they are being sold inside there somewhere. Countries like Ghana get good mention as suppliers of apparel to the United States markets, while we don’t even make our yellow or blue campaign t-shirts here on the ground! And the irony gets thicker when you consider that the United States dollar is now at its strongest worldwide, and we should therefore be doing our damnest to earn in THAT currency by exporting TO them. But when did YOU last hear about AGOA, if you didn’t notice that little story on Page Two Monday? Have you seen any follow up story yet, or been invited by anyone hurriedly setting up a project to take advantage of the AGOA extension? There is another angle to the AGOA story and Eggs – as the extension was almost thwarted because South Africa had refused to accept the import of poultry products from the United States. …should we go to Iganga and retrieve that incubator so we use it to produce eggs that can be exported tariff free to the United States in exchange for that very strong dollar?